Ok, so this rp takes place alittle after TLK2. 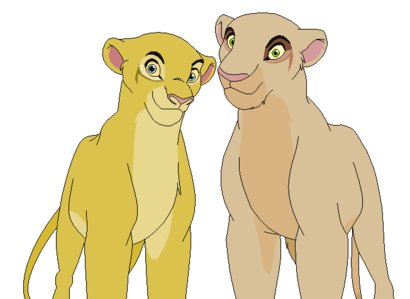 Where Kiara & Kovu are now Queen & King of Priderock after Simba & Nala step down. 2) No Killing others without permission! Bio: she can get very impatient and also she likes to play a lot and sometimes she sneaks off so then she can explore her father is kinda protective of her and tries to keep her in the 'pride rock bounds' of course she always gets bored but her brother keeps her company! 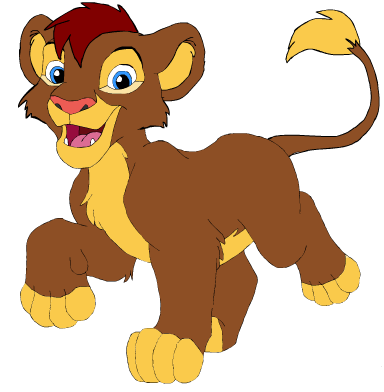 Other Info: He's the son of Kiara & Kovu as well Kayla's big brother. Bio: Saber is just as impatient as his sister and loves to explore with her but because he's the older cub, he often tends to think befor he leaping even more so when Kayla gets them into dangerous places. Nala sighed "your grandson is waiting for you Simba" she said as Kayla then jumped on Simba's back "Grandpaaa Grandpa come on!" "Now I know how my dad must had felt, when I use to wake him up like this." Simba replys back to Nala as he got up with a big yawn, Then turns to the cubs while asking. "Ok you two, I'm up! now why did you wake me up this eairly?" Saber puffs his chest out while anwsering. "Because you said, that you would show us were you and Great Grandpa hanged out this morning." "I did really say that, because I don't remember saying that?" Simba trys to play dumb. Kayla pouted "Grandpaaaa you promise!" Simba smile whlie saying a jokeing tone. "Ok you win, now come on befor I make you two eat breakfast with Timon & Pumba." with that Simba starts to walk out. Saber follows while saying in cocky tone. "Ha! Funny Grandpa, I bet could down way more bugs than those two. heck sis, here couldn't even eat one little worm on a dare." Kayla glared at Saber "says the lion that can't even go swimming in the lake and panicked when he was in the shallow end!" "WHY YOU!!!" Saber grows out as he pounces on Kayla to try pining her while they roll passed their now awaked Grandpartents. 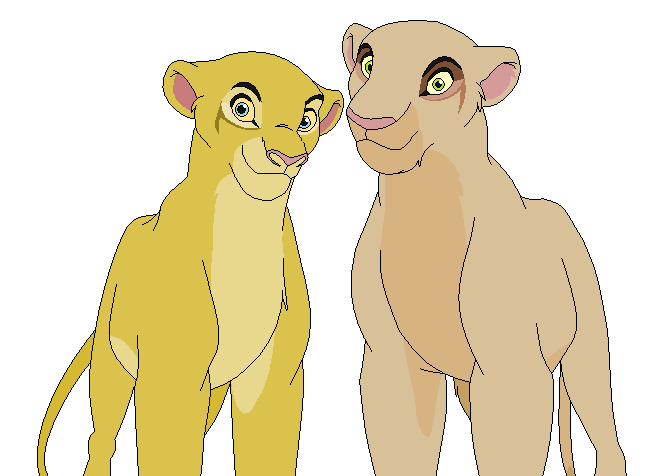 Simba just smiled as he looks Nala while asking. "Remember, when we use to play that game?" Kovu wakes up from the noises of the cubs while saying as he yawns. "Great their at it again, hon!" Kiara woke up from the noise and looked at them and sighed as she got up and wokes over picking Kayla up as Kovu picked Saber Kayla poked her tongue out at Saber "Kayla that's enough now"
"Grrrrr, Let me at her!" Saber said with a grow as he dagle from Kovu's mouth. "Woooo KIller, you need to cool it as well. beside I'm pretty sure your grandpa won't show you his pot if your acting like brats." Kovu tells the cubs as he puts down Saber but quickly pins him with a paw. Simba walks up while saying. "Ok, you two are you going to play all day or do you want me to show you the spot?" A few seconds later Simba and the cubs are at the spot which overlooks the pridelands. "OK, you two...here we are! The spot were my dad and your Great Grandfather first show me the kingdom. " Simba said to the cubs with a smile. Saber looks over the edge while saying. "It's cool view and all but I don't like the fact that the spot was on the roof the whole time!" Kayla looked around then after she sniffed something and looked to see Pumba and Timon coming "hey look there's uncle Timon and Uncle Pumba!" Saber quickly shot his head up while saying. "Awsome!! The perfect two to test my skills on, Listen Grandpa and Kayla.... I'M... NOT....HERE!!!" He tells Simba & Kayla while quickly hidding behide a big rock. Simba nods with a smile while saying. "Right, It's just Me and Kayla up here." Kayla giggled as Timon and Pumba came walking up "hey what's the giggling all about?" Timon said as he put his hands (they seriously look like hands) on his hips "oh Grandpa was telling me this great joke!" Pumba looked around while asking. "Hey Simba, Where's Saber? cause the other said he was up here with you & Kayla." Saber quitely sneaks up behide Timon & Pumba but crouchs next to a small rock. Simba just answer with. "Oh, he's up here somewhere?" Saber quickly gets right behide the two while saying. "Ooooh, Uncle Timon and Pumba!? ROOOOAR!!!!" He lets out an almost perfect roar. "AAAAAAAAAAHHHHHHHH!!!!!" Pumba quickly jumps onto Timon in fear while screaming a bloody scream. Kayla started laughing as Timon was trying to hold Pumba up but then fell on his back "owwww" Timon said as Kayla was still laughing "nice one bro!" "Hey! that wasn't funny you three. Saber, Almost scared me to death and me crush Timon." Pumba said in a somewhat angry tone. Saber just falls back on the ground while rolling in laughter. "I'm sorry guys but you know the cubs are just playing with ya, beside you should have seen your faces!" Simba reply while trying hard not to laugh. Simba nods while saying. "Yeah but please don't get into danger"
"Don't worry Grandpa, I'll protect sis from any danger." Saber said while he quickly get up and trys to look tough. Kovu walks up with Kiara while saying. "Well to be on the safe side, Timon & Pumba are going with you as well as Zazu. Btw Nice Roar, Son!" 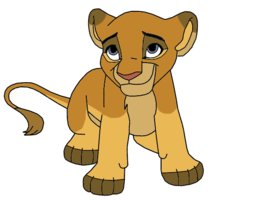 Kovu sighs looks at Kiara while asking. "Kiara can you back me up here?" Bio: The oldest of Kiara & Kovu, she was the first to open her eyes in which she should be named queen but she doesn't want to. She's smart and she speaks for the rights of others who cannot. "...Well that's for your parents to decide...Sier! I have found Tau out near the edge of the pridelands." Zazu went on and on about how dangerous the outlands still are. "I know! Ok?" She growled at the bird, just ready to rip his insides out.